Ryan Blackadar, a guide for Rocky Mountain River Tours, lines up his raft for the next rapids on the Middle Fork of the Salmon River in Idaho. I had a mission: come up with a bucket list summer trip that would somehow enthrall a busy spouse and a sports-mad son. I found it on the Middle Fork of the Salmon River in Idaho. 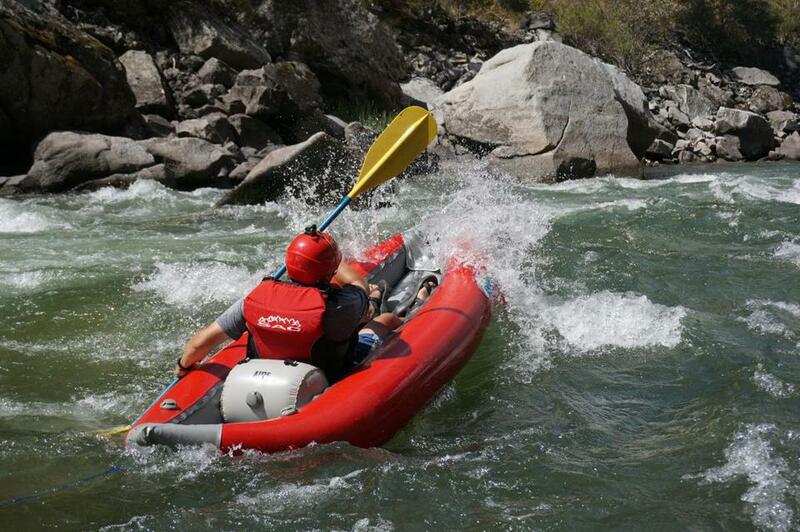 The Middle Fork is renowned as one of the premier whitewater runs in the world. It is one of the original eight rivers designated in 1968 in the Wild and Scenic Rivers system. It traverses the largest unbroken wilderness area in the lower 48 states, the 2.3 million acre Frank Church-River of No Return Wilderness. 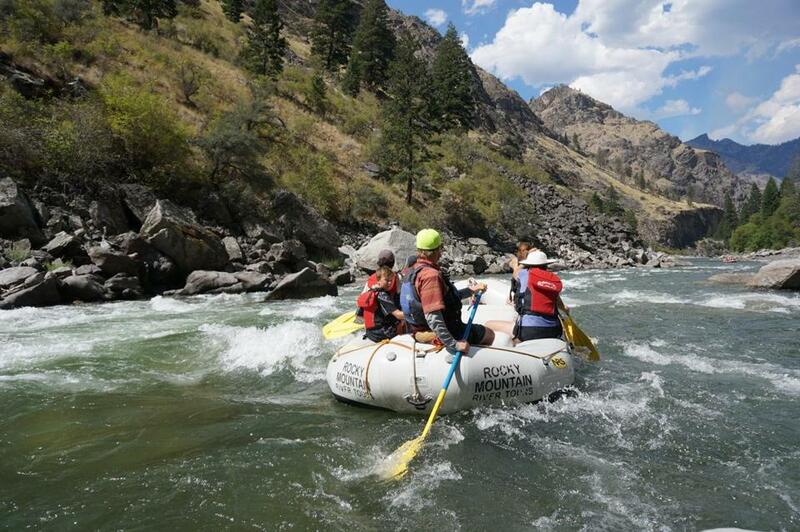 The rapids and scenery on the 100-mile trip are world class, and the area is steeped in legend. An added bonus is that the trip takes just six days, about 10 days shorter and more affordable than Grand Canyon river trips. 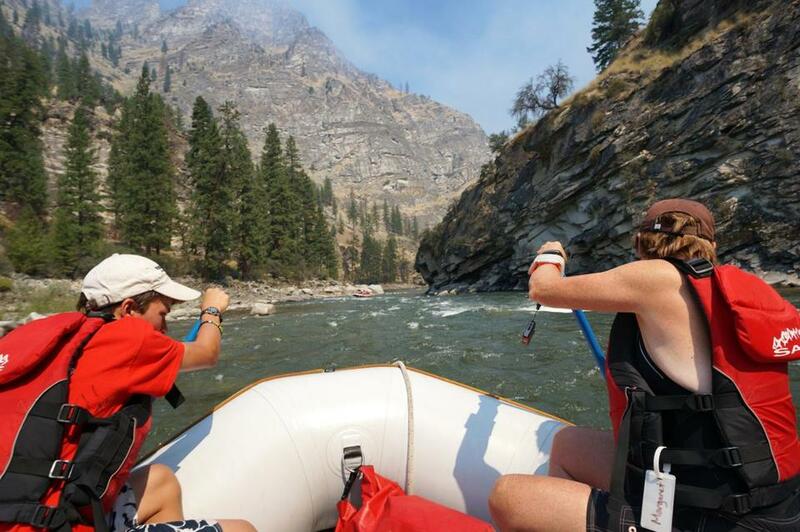 My wife, 15-year-old son, and I joined Rocky Mountain River Tours (rafttrips.com) on a trip reserved for families with teens, the prickliest of customers. The prospect of adventuring with other teens, instead of just being in the wilds with parents, was a bonus attraction for our son. Rocky Mountain River Tours offers experienced guides, great food, and plenty of comforts. Our group of 24 guests and six guides assembled in the small town of Stanley, Idaho, located at the foot of the Sawtooth Mountains. We were a diverse bunch, including three generations of a family from Maryland, an adventurous Texas grandmother and her two grandsons, an avid fly fisherman from San Francisco and his wife, a Camden Yards beer hawker, and a family of four from Silicon Valley. Mason Roberson and his grandmother Margaret Gorcyca digged in for the next rapid on the Middle Fork. The remoteness of our destination was underscored when we had to squeeze into small planes and fly 30 minutes to a dirt landing strip alongside the river. 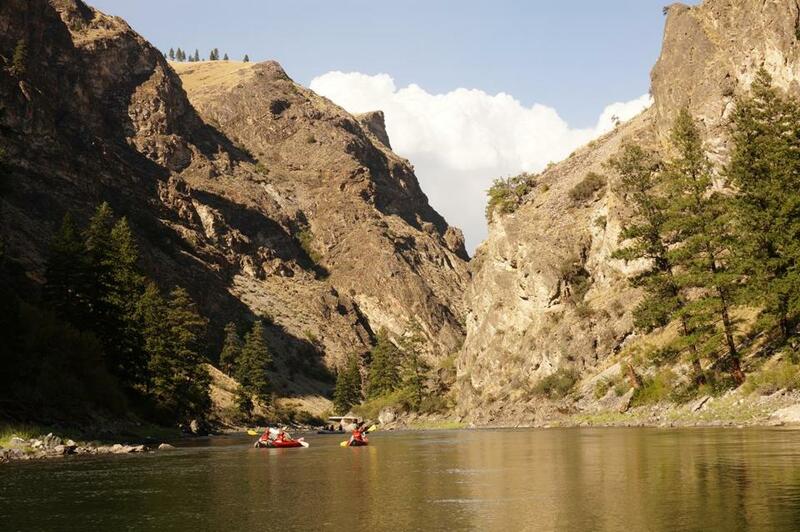 Only seven groups per day are permitted to launch on the Middle Fork, so despite the fact that 10,000 people travel the river each year, we had the sense that we were alone in the wilderness. Before boarding our boats, a Native American woman addressed us. She invoked her ancestors, the Shoshone, or Sheepeater Indians, who once called the land around the Middle Fork home. She said a blessing on the earth and wished us safe passage through this remote landscape. The ritual signified that we were leaving the ordinary world and entering an extraordinary one. Each paddler could choose a mode of travel to suit their mood and energy level. You could relax while a guide paddled an oar raft, paddle with six others in a paddle raft, or solo pilot a rubber kayak, or ducky. The teens instinctively bolted for freedom by jumping into the half dozen kayaks. 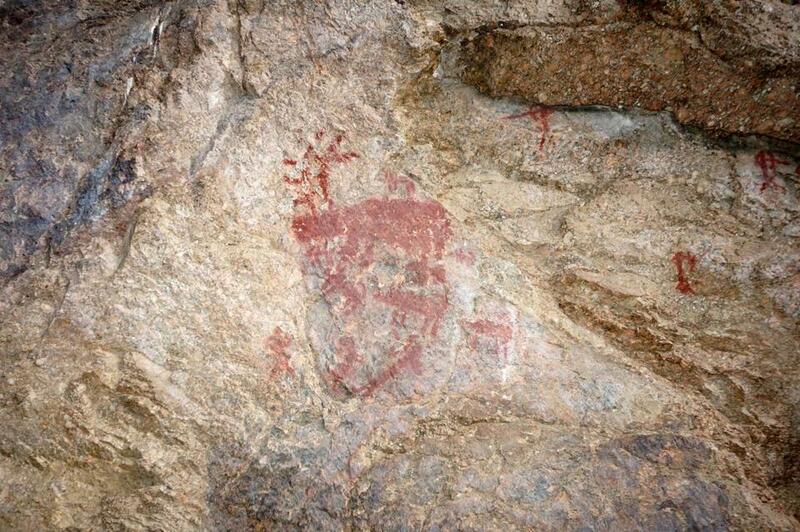 Ancient Native American pictographs found in a cave alongside the Middle Fork of the Salmon, evidence of Shoshone habitation. We pushed off into the swift current under crisp blue skies. The clear water sparkled in the midday sun. The river swept us along at a brisk clip, and rapids began to get progressively bigger as the afternoon wore on. We reached our campsite after a relatively short 8-mile trip. The guides whipped up a delicious dinner of lemon tarragon salmon, a cheese and tomato salad, and a homemade two-layer carrot cake. The consistently great food felt like a guilty pleasure out here in the wilds. The question of how teens could entertain themselves in the wilds with no devices and no Internet access was quickly resolved. After dinner, an energetic game of beanbag toss broke out, luring in many of the trip participants. This was to be a nightly ritual of increasing competitiveness, especially among the younger crowd. In this hyperconnected age, the simple pleasure of connecting with one another over a simple outdoor game took on special meaning. The next day, I climbed into an inflatable kayak. Down at eye level looking up at standing waves, I suddenly felt very small. The duckies were remarkably forgiving, bouncing off rocks, racing up the face of waves and plunging down the other side into watery froth. The author, David Goodman, surfs a wave on the Middle Fork. Midway through our second day, the water turned from crystal clear to the color of latté. It was a blowout, in which a side stream flushes minerals and sediment into the main river. This was an unwelcome development for the avid anglers in our bunch, many of whom happily fished all day off the backs of the boat. On our third day on the river, we took a break from bounding through rapids to hike up to a cave with Indian pictographs that depicted centuries-old scenes of hunting. The ochre-colored images were perfectly preserved on the cliff face and only viewable by the handful of travelers down this canyon. Guide Ryan Blackadar offered to connect our modern journey with an ancient one when he led a few of us on a hike up Papoose Creek. This obscure side stream figured prominently in the Sheepeater War of 1879 that rousted the Shoshone Indians from their traditional lands in the Middle Fork. The six-month-long conflict was the last of the so-called Indian Wars of the Pacific Northwest. In 1879, a detachment of the US Cavalry was sent up the Middle Fork to investigate the deaths of five Chinese miners, which locals blamed on the Shoshone, though there was no proof. Troops of the Second Infantry captured a Shoshone woman and ordered her to return with her chief. The soldiers kept her baby to ensure she would come back. The Shoshone woman came back empty handed, but a day later an Indian chief named War Jack surrendered, saying he was tired of fighting. Fifty one Shoshone Indians surrendered and were forcibly relocated to reservations in Washington. This marked the end of the Shoshones’ life on their ancestral lands. I scrambled up over boulders and through dense forest to what Ryan promised was a magical spot. Rounding a bend, I was suddenly surrounded on all sides by thundering cascades. I plunged my body through a waterfall to find a seat in a fern-covered cave behind the curtain of water. It was a lush oasis in a harsh landscape, a place of power and sorrow. That afternoon as we floated downstream, forest fires broke out on the mountains around us. That evening, rocky summits glowed orange as flames danced high overhead. It was as if the river spirits were reminding us that we were mere visitors in this awesome landscape. On our final morning, brown smoke from the forest fires swirled and then mysteriously parted as we entered the rapids of the Impassable Canyon. A bear and a mountain goat scampered along the river bank as we drifted through. We had been on the river just six days, but it felt as if we had been away for a month. With that, the spirits of the River of No Return released us, casting a spell that would linger far longer than the river itself. David Goodman can be reached at david@dgoodman.net.